The hard work shouldn’t start until you get to the job site. Experience the Workman® MDE with SRQ™ for optimum operator comfort and enhanced productivity. All of the benefits of electric power plus you don’t have to sacrifice payload capacity when you choose the MDE. SRQ™ combines a coil-over shock absorber suspension design with the Active In-Frame™ twister joint. Front suspension is Independent A-Frame design with coil-over shock absorbers. Benefits include operator comfort, safety, reduced operator fatigue, and productivity and efficiency gains. Double-walled composite bed can withstand the elements and heavy loads, and won’t rust or dent. Eight 6 volt heavy-duty T145 Batteries. 500 amps controller. 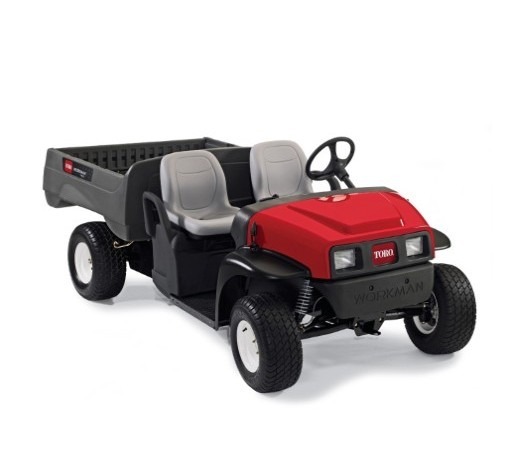 Extended run batteries and regenerative braking for a longer per charge work capacity and whisper-quiet operation.